With all of the controversy around genetically modified (GM) foods, sorting through huge volumes of information can seem like a daunting task. Many members of the public are asking questions about GM foods and they are also raising concerns about the effects these foods may have on their health or the environment. There are different advantages and disadvantages of GM foods, although to what extent they can help or harm humans and the environment is a debatable aspect of this technology. A proposed benefit of GM foods is that they can potentially produce higher crop yields, which could help by feeding more people in developing countries. 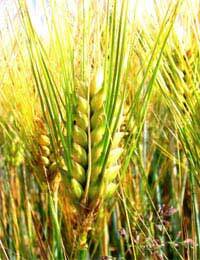 They are also cited as more economical, despite the initial higher cost of the seeds. The rationale is that they reduce the need for pesticides and herbicides as well as reducing the manpower needed to successfully grow the crops, which should translate into improved financial gains. Improved food quality is another benefit associated with GM foods. A tomato, for instance, can be engineered to stay fresher for longer, thereby extending its shelf life in the supermarket. Yet another benefit that is believed to occur from GM technology is that crops can be engineered to withstand weather fluctuations and extremes. This means that they can provide sufficient yields and quality despite a severe, poor weather season. Another benefit is that GM foods can be engineered to have a high content of a specific nutrient that is lacking in the diet of a local population group. The vitamin A rich 'golden rice' is one example of a GM food that has been engineered to have high levels of a nutrient. A worrisome issue in GM foods is the ability of a food to trigger an allergy in humans. Some of the genes used in GM technology might be taken from a food that causes allergies in some people. Inserting that gene into another organism could cause the host organism to express that allergen as a trait. Alternately, a new allergen could be produced when genes are mixed across different species. Another potential downside to GM technology is that other organisms in the ecosystem could be harmed, which would lead to a lower level of biodiversity. By removing one pest that harms the crop, you could be removing a food source for an animal. Also, GM crops could prove toxic to an organism in the environment, leading to reduced numbers or extinction of that organism. Given that some GM foods are modified using bacteria and viruses, there is a fear that we will see the emergence of new diseases. The threat to human health is a worrisome aspect of GM technology and one that has received a great deal of debate. There are many other potential benefits and risks to GM foods, which you will likely learn about as you investigate the topic further and decide whether or not you want to support or avoid GM foods and related technology. Reading a brief fact sheet is a good way to familiarise yourself with the purported benefits and issues related to GM foods. In this way, you can equip yourself with an overview of the knowledge needed to make an informed decision about GM foods and how they will affect your life. Find out more about GM foods by reading our articles about the Development and History of GM Foods and also find out the Types of Techniques Used to Genetically Modify Food. It's called, We all have a choice, either we buy into it or not! Stop letting big pharma and governments push you around. Stand up to them. It's time we all stood up to the government. your all forgetting that satan approved GMOs in His book of revelations which you would know if you were at the satan-lizard cross over meeting in the White House last tuesday... if satan approves it then i guess it means we should all approve it because satan has given you everything you could want in this world so we should bow down to him. the lizards are ok i guess coz at least they collaborate with satan. Lizards and satan are pro GMOs! My Lizard King, it is time for our reign on this weak planet with the ever increasing amount of 'GMOs,' as they call it. Let us rule the comment section and this world, together, forever. Allah ackbar. Gmo's are interuupting the spirtual world and disrupting the connection between true Pagans and the god and goddess. My powers and magic are weakening since i have begun eating genetically modified foods. I now have to harness even more power from the moon to charge my crystals for my rituals. Wicca society is now being threatened by these gmos and I must warn you all, us Wiccans will not remain silent. We will rise above you all. I have an assignment and this is the article I chose to review it's credibility. Would you mind linking me the sources of where you found these facts. I would need them as soon as possible please?! Okay seriously calm down for one we don't know if god is real or notbecause we don't have solid proof except for "man's" word and we hate Muslims but Arabic and Muslims wrote the bible and two gay is not a sin if god is real then we know he would love all his children for who they are. Drop the mic P.S I'm a 13 year old and i outsmarted all of you. In this essay, I aim to explain why feministchristian222 has lied to you all. My first point is that God is decisively not real. After spending my spare time at Cambridge disproving the bible, I have conclusive evidence to say that god is not real. This therefore, through logic, means Christians aren’t real. Do not believe feministchristian222 as she is purely a figment of your imagination, not real in the slightest. I am deadly serious. Just try to stop thinking about her and it will all go away. Secondly feminism is stupid as it is obvious to me that men are clearly superior to women. This argument means you are not worth listening to even if you are right. In conclusion, I feel that you are wrong, and I, as always, am right. I agree with feminist christian. My son is now gay. gm crops are against the bibles rules. we should never mess with the eternal one's plan for us. if he says that normal rice should make people blind, they were meant to be blind. these chemicals in the crops are turning our children gay and making them sin. i eat food we christians were sposed to eat, given by god, fresh and tastie. i believe gm crops are the start of the rapture and satans way of tempting us folk. i read a tumblr post that said gm crops are scientifical experiments gone wrong and that sterring clear of them is the only way to get to heaven. i hope yall agree. How do you know how it will react with different bodies eating food that is genetically modified.My thoughts are that it creates more product which in turn creates more money so let's push it to whoever will accept it and doesn't know any better. My question is--- how will it affect humans in the long run, or is it affecting them already but we are not told of the results because the bottom line might be in jeopardy.!!!! THis site helped me! More detail would be good though. You can access the rest of the pages across the site (listed in the left-hand topic column), which will give you more detail and information. Fearful of our child- Genetically engineered food has been around since 7,800 BCE. The fruits and vegetables that you ate when you were a kid, probably were genetically engineered. But when you were a kid many didn't care about genetically engineered foods. "Issues" arising from genetically engineered food started in the 1980s, partially from people being uneducated about what genetically engineered food is. Children maturing at a younger age isn't from the genetically modified food they eat, but from the genes that are pasted on. Evolution of the human population is bound to happen. That is just an example how. If golden rice didn't exist many women, men, and children would be blind and/or be extremely malnourished in developing countries. The golden rice will could reduce blindness (500,000 children per year) and deaths (2-3 million per year) from malnutrition.I understand that you don't support GMOs. But why would you not use science to help those who need it. I think that is "crap". I understand that you are unsure about GMOs. But please remember the good that they are capable of. With our population projected to reach 9 billion by 2050 we need to start look at ways to feed that many people. Farm land is decreasing, farmers age is increasing, and people are currently going hungry/ being malnourished and our population is 6 billion.